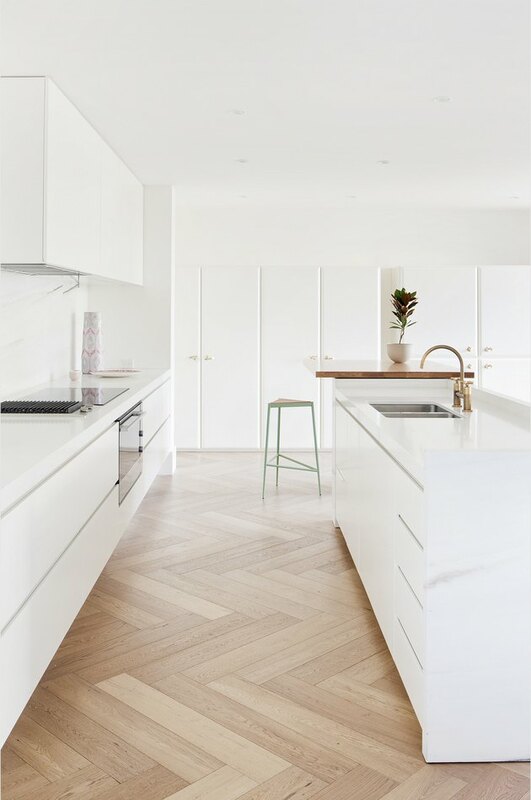 There's nothing quite like a fresh, clean, white kitchen. 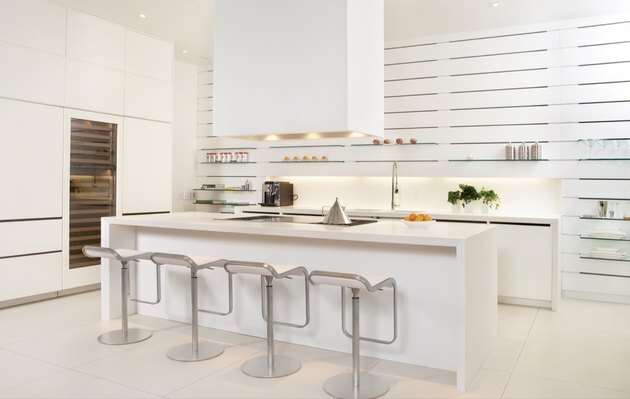 But if a white kitchen is modern in style, it doesn't mean that it also has to be stark, cold, and sterile in feel. 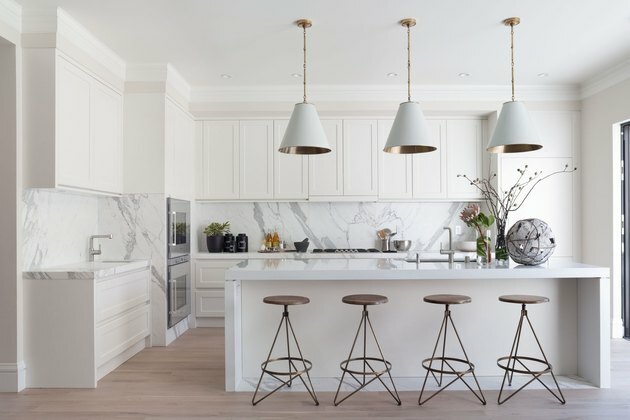 From pristine cabinetry to paint colors to accessories, there are so many ways to work white in your cooking space. 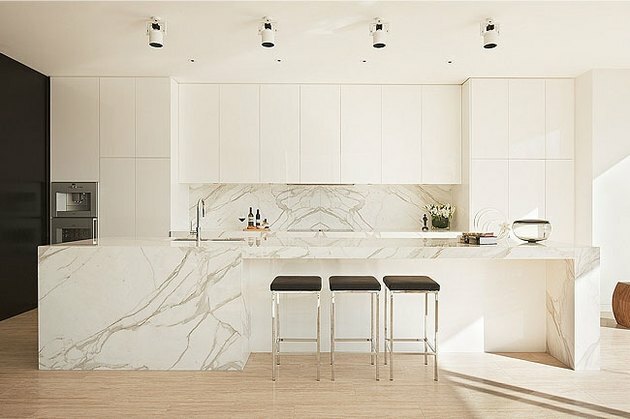 Check out these 10 ideas that can bump up your modern, white kitchen a notch. 1. Add visual interest via your flooring. These chevron hardwoods are gorgeous without being flashy. They're the perfect match to a minimalist white kitchen. Plus, chevron-patterned flooring won't close in a space because it draws the eye both vertically and horizontally to create balance. 2. Splash out on your backsplash. A beautiful backsplash really shines in a modern, white kitchen. Try marble, or take a (pretty) risk with patterned tile. 3. Mix modern and natural. Mixing stark cabinetry with natural, light-hardwood accents softens the feel of a modern kitchen. Lightening your hardwood floors can also be a DIY project. 4. Seize the opportunity for bold lighting. 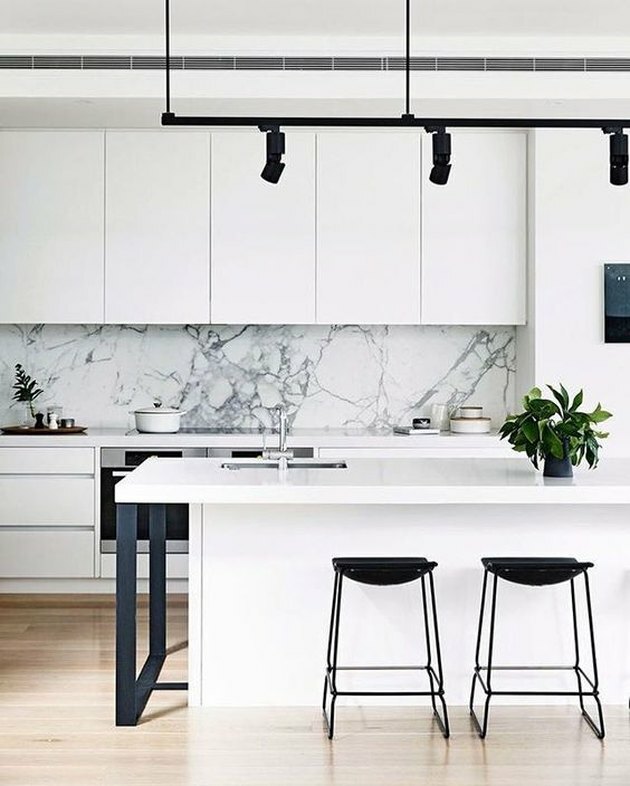 If you're worried about pulling off a bold light fixture, just keep the rest of your kitchen simple. You can incorporate neutral colors and varying textures as well, without risking the space looking over-the-top. 5. Mix vintage and modern for a distinctive feel. 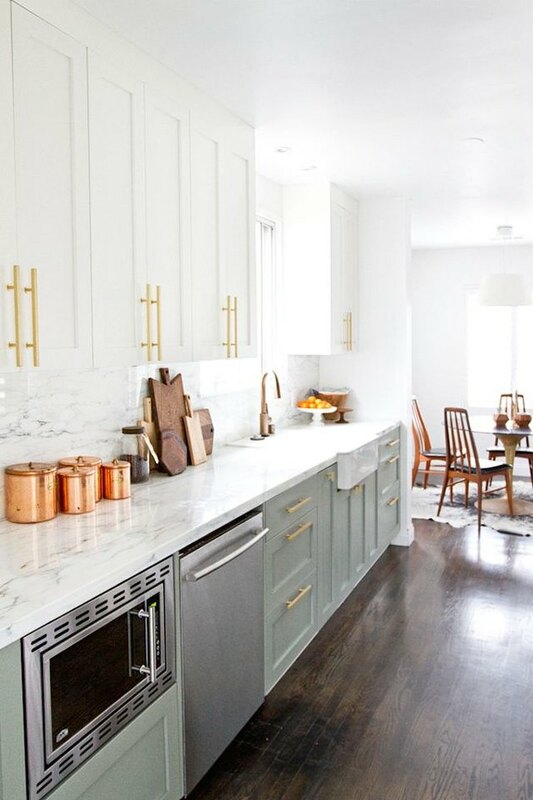 By simply adding some vintage-inspired teal paint and gold hardware, this plain, minimalistic kitchen gains its own personality. It's practically made to be Instagrammed. Modern kitchens don't all need to have plain, white cabinets. This open shelving is stunning, and simply put, just something unexpected. There are so many ways to style open shelving and it's a great way to display your favorite pieces. 7. Match your island to your backsplash. If you have a kitchen centered around an island, why not try something unexpected? 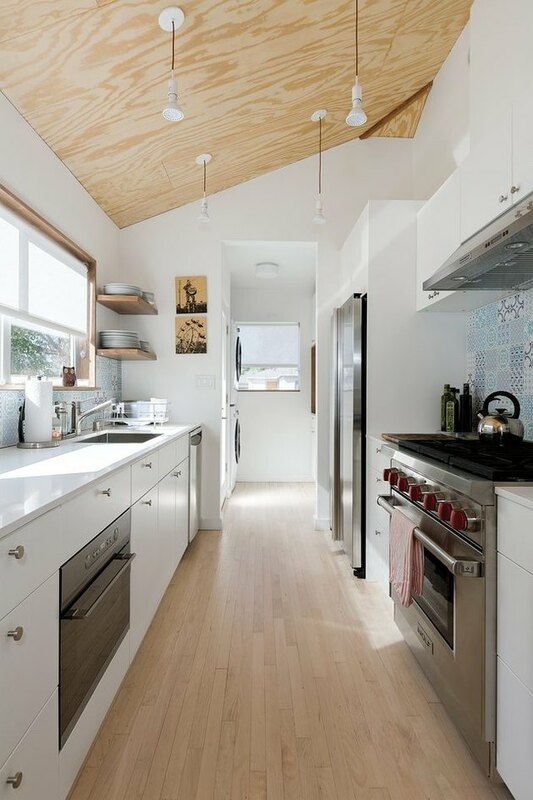 The simple backdrop of a modern, white kitchen allows you to pull off this matchy-matchy look. 8. Let your accessories do the talking. 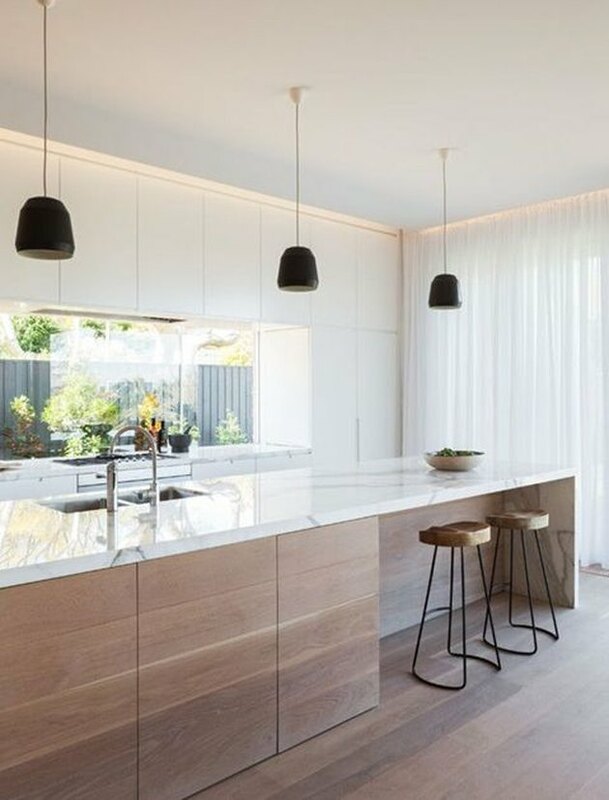 Try keeping your kitchen simple, but also adding in exciting accessories like geometric bar stools and show-stopping pendant lights. This one is a super easy switch-up with big impact. 9. Pick an accent color. Break up all the neutrals with a splash of color, as seen on this pretty blue backsplash. You can also incorporate color into your accessories, lighting, or cabinetry. 10. Go for black and white. Why not go for a black and white look? 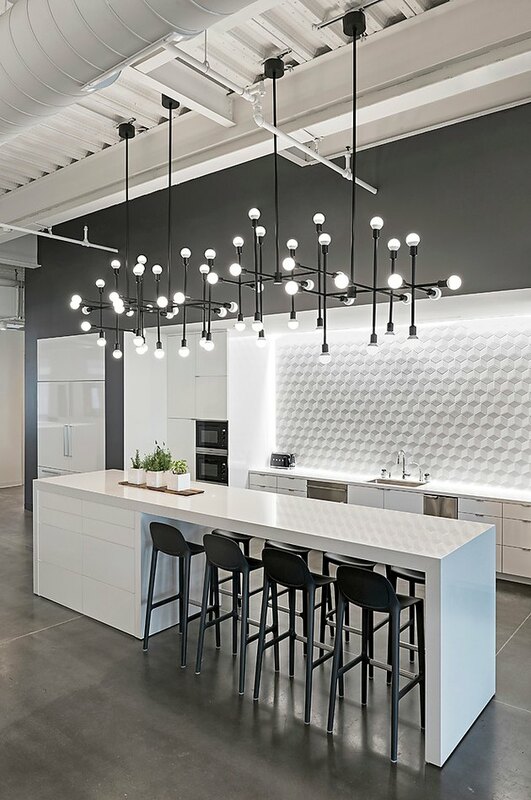 You can subtly incorporate black into your backsplash and hardware while still keeping that white kitchen feel.